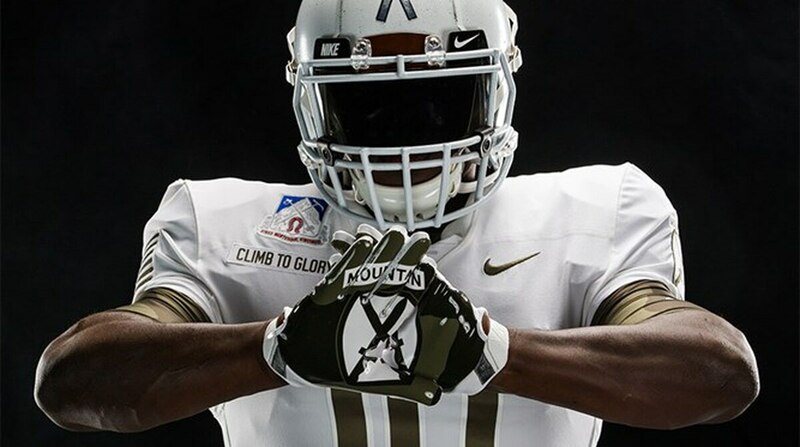 Army West Point football players will honor the cold-weather warriors of the 10th Mountain Division, and the unit’s World War II origins, with special uniforms set to debut at Saturday’s Army-Navy game. A “whitewashed” helmet with flakes of olive drab, simulating the effects of wear on the makeshift white paint jobs performed by World War II-era 10th Mountain soldiers in snowy locales. Patches honoring some of the units once attached to the 10th Mountain Division, and a “Climb to Glory” patch honoring the February 1945 climb by soldiers over the 1,500-meter Riva Ridge in Northern Italy, which led to the defeat of unsuspecting German forces. Nods to unofficial unit symbols such as the crossed-skis insignia and various panda-themed images, developed by those serving at the unit’s Pando, Colorado, training facility. Flag patches on the shoulders bearing 48 stars. They’re period-authentic to the Army’s first mountain-warfare unit, which was stood up the day after Pearl Harbor. The white uniforms come one year after Army ended Navy’s 14-game rivalry win streak while wearing dark grey unis designed to honor the 82nd Airborne Division. Last week, Navy unveiled its 2017 gear, with a Blue Angels theme. The Army-Navy game will take place Saturday at 3 p.m. in Philadelphia. Get more coverage here.